What should be done with more than 800 extremist foreign fighters who have fled or been captured after the fall of the last town still held by the so-called Islamic State of Syria and Iraq (Isis)? President Trump wants those who made their way to Syria from Europe to join Isis to be returned to their home countries. They should all be put on trial, he said in tweet at the weekend. Otherwise, he warned, they would “permeate Europe”. And this would put European countries at risk of further terrorist activity, his officials said. Trump has already announced that he is soon going to pull all American forces out of Syria. He said that unless Europe assumed responsibility for dealing with its citizens who joined Isis, the US would no longer be able to hold them prisoners. The issue has caused a huge political controversy in Europe, especially in Britain, where more than 400 fighters came from. The British government has announced that it will not allow most of them to return home and would deprive them of their British citizenship. The head of British intelligence said they would pose a serious and continuing threat to British security if they came back with what he called their “dangerous skills” and carried on their terrorist activities. But last week one of three young girls from east London who went to Syria in 2015 to join the fighters was found by a reporter for The Times newspaper hiding in a refugee camp. Shamima Begum, a Londoner of Bangladeshi origin, abandoned her family in 2015 at the age of only 15 and secretly made her way with two other girls to Syria. She married a Dutch Muslim convert fighting with Isis and had two children – both of whom had died from starvation and disease – and was about to give birth to a third child. She expressed no regret at joining the extremists, and said she had not been upset by the Isis atrocities, including the sight of a severed head thrown into a bin. But she wanted to return to London to save the life of her third child. The baby, a boy, was born on Saturday, and her case has split British public opinion. Many people agree with the British home secretary – himself a Muslim - who announced that he would not allow her to return. They said that she was just as guilty as the male fighters and had willingly supported Isis. But others argue that the wives and children should not be treated in the same way as the men who had fought against western forces in Syria and Iraq. 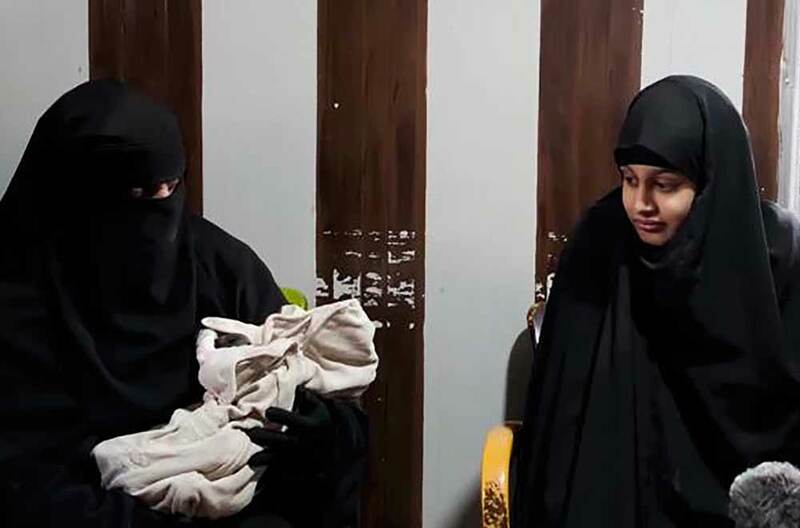 They say that Shamima’s new baby should not suffer for what his mother did. Instead, they want her to be brought home and put on trial for her role in supporting extremism. The baby should be given to the teenager’s parents to look after. Taking back all the extremists who fought in Syria will be difficult and costly for all their home governments. Altogether, around 6,000 people from across Europe were recruited by Isis. Many have clandestinely tried to return, sneaking out of the besieged cities to make their way to Turkey and back home. Intelligence authorities say that about a third of Belgian and German nationals have returned, but France has a return rate of only 12 per cent. Each country has announced that it intends to put the fighters on trial for terrorism. But it will be very difficult to gather enough evidence of what each individual did when he or she were in Syria, and hard to prove in a court of law that they were directly involved in atrocities. It is even more difficult to know what charges should be brought against the women who were married to jihadists. The first big challenge will be to force the last fighters to return. Many of those who remained in Baghuz, the Syrian village on the Iraqi border where the so-called caliphate put up the final resistance against the US-backed Kurdish forces, surrendered. Others were killed in the final battle. Those extremists who escaped Baghuz will probably try to flee to other parts of the Middle East or to hide their real citizenship so that they can avoid being imprisoned in their home countries. It will need a large group of western soldiers to guard them and it will be costly to send planes to bring them back. There is also the tricky problem of how to change their ideas and extremist ideology. “De-indoctrination” programmes in the West have so far had little success in persuading Islamist fanatics to renounce their beliefs or settle down peacefully with their families at home. And those who have been imprisoned have often spent their time radicalising other prisoners and spreading the virus of Islamist extremism to prisoners who were not Muslims. There is little time left to debate what to do. Trump has made it clear that he thinks America has spent enough money and lost too many American lives in the Middle East, and he is determined to bring all US forces home. He says the Europeans should now shoulder responsibility for what their citizens have done. The British government’s wish to remove citizenship from all those who went to Syria is popular with voters. But it is technically illegal – under United Nations laws, unless a person holds dual nationality, he cannot have his citizenship removed if that would leave him stateless. France, Germany and Belgium, where the bulk of the Isis recruits came from, are already preparing measures to deal with those returning. France intends to repatriate as many as possible and prosecute them – providing individuals are afforded a fair trial. Those returning to Germany are already subject to criminal investigation. At first Germany said it would treat men and women extremists differently, but in 2017 it announced that all those suspected of belonging to Isis would be treated the same. But the threshold for prosecution seems to be much higher in Germany than elsewhere, and simply being in Syria and Iraq will not necessarily lead to an individual being detained. In Belgium, where there have been numerous terrorist attacks by Islamist extremists, all those suspected of having fought in Syria are arrested and sent before a judge. Those suspected of being involved in radicalisation can be sent to specialist units, where they are separated from other inmates. Conditions are more lenient in Denmark – returning fighters may be offered access to employment, education, housing and psychological counselling. So far, only about 1,800 fighters have returned to western Europe. Many, however, came from eastern Europe, and they can expect harsher treatment on their return – especially in Russia. Many Isis recruits came from Chechnya and other Muslim regions of Russia and they will be seen as especially dangerous. The bulk of Isis fighters are from the Middle East itself – with between 14,000 and 18,000 in Syria and Iraq. Some have melted back into their communities. Many are expected to go underground and regroup in cities such as Mosul. When the Americans leave, the Kurds now holding many Isis prisoners fear an attack by Turkey, which sees the Kurdish forces as a threat to Turkey itself. Most of these prisoners will probably then be released. It is a nightmare now worrying all Europe. Will these fighters become a new underground terrorist threat to all the West? For Trump, this is no longer an American issue: it is up to Europe to defend itself in future, he has suggested.